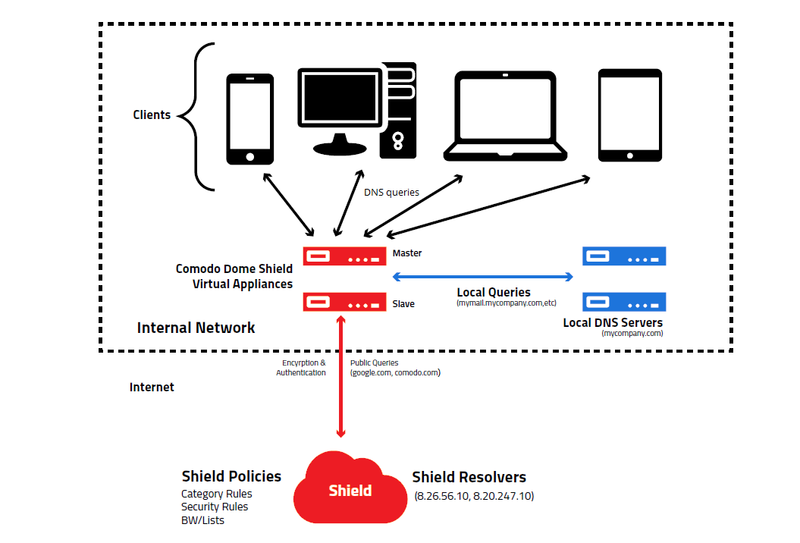 It’s been around a year since we first launched Comodo Dome Shield, the FREE of charge DNS-based security service. Dome Shield provides a first line of defense against web-borne threats by blocking access to known malicious websites, providing web domain filtering and advanced reporting and analytics. Since then, Comodo Dome Shield has become the #1 choice of DNS-based Content Filtering Solution of IT Staff all around the World, securing more than 30 Billion DNS requests every day. Our users include MSPs, schools, K-12s and enterprises of all sizes from all around the World. Comodo Dome Shield provides the easiest way to block malicious and risky web access such as Phishing, C&C Servers and Malicious URLs, as well as providing the ability to create a company web browsing policy – on and off-premise. Our users are able to create location and endpoint based security and content filtering rules with ease, using Dome Shield. One of the biggest pain points of our customers is, solutions that let them create internal IP and network specific content filtering rules are expensive, hard to deploy and manage. Here at Comodo Cybersecurity, we care alot about what our customers need. For this reason, we have been working very hard for the past couple of months to help solve this problem. We have released Comodo Dome Shield 1.16 which lets our customers to create internal IP and network specific content filtering rules with ease and completely for FREE! • Internal IP Based Rules and Reports: By using Local Resolvers, you can create rules for your internal IP/Subnets! Making Dome Shield’s rule management more granular, you can even observe every single PC via Reporting over the cloud. • Internal Domain Bypass: Previously, using Dome Shield with Active Directory managed domains or networks with local servers was hard. Now you can simply add them to your internal domain bypass list and Local DNS Resolver can forward such DNS traffic to your internal DNS servers which can resolve your internal domains, making Shield adapt to your network seamlessly. • Site Management: You can manage your DNS Egress points separately by installing different Local DNS Resolvers to your different sites. It makes it possible to manage different Sites of your customers per their DNS traffic and rules from a single-pane-of-glass. • Block All Domains: This was also another major request coming from our customers, where sysadmins wanted to only allow only a couple of domains and block everything else. Now, you can do this with a single click. • False Positive Management: Dome Shield 1.16 offers a new tool called “Domain Classification Requests” on the Policy screen. Without having to leave the portal, you can simply learn the categories of domains, propose new categories and then automatically blacklist and whitelist them if you wish. All the reports and B/W lists get updated according to your requests and we re-analyze all proposals in 48 hours which you can observe from the same menu. • New DNS Nodes: We have added new POPs to France and Germany. Moreover, we have updated all our existing nodes in USA and Europe for providing lower latency and higher uptime. • Roaming Agent for MAC: A new agent will be provided for MAC Agents, with the same capabilities of the existing Windows Roaming Agent. This will give our users the ability to secure and apply content filtering rules to Roaming MAC Computers. • Active Directory Integration: Creating and managing user/group/department based domain filtering and security rules of Dome Shield will be possible. Moreover, it will give our users the ability to generate user/group/department based Reports. Don’t Have Dome Shield License ?